This article is about the model introduced in Halo 5: Guardians. 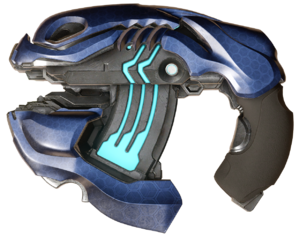 For the model introduced in Halo: Combat Evolved, see Type-25 plasma pistol. The Type-54 Directed Energy Pistol (T-54 DEP), also known as the plasma pistol, is the post-Covenant War successor to the Type-25 plasma pistol. The T-54D plasma pistol was used extensively by the Swords of Sanghelios and Jul 'Mdama's Covenant in October 2558. It is also the preferred sidearm for Spartan-IV Olympia Vale. It is classified as a Common REQ and can be summoned in Warzone at Level 2 energy. Spitfire: The Spitfire is an improved T-54D produced by Kig-Yar armorers that features a faster rate of fire and reduced heat generated per shot. It is classified as an Uncommon REQ and can be summoned in Warzone at Level 3 energy. It can also be found as the second hidden weapon in the campaign on the level Genesis. Void's Tear: The Void's Tear is an advanced T-54D that features overcharged shots that create an unstable gravimetric vortex by superheating exotic nuclear isomers. At the point of impact, the overcharged shot pulls in nearby objects and then explodes. Unlike other Plasma Pistol variants and the Incineration Cannon, keeping the Void's Tear charged for too long does not deplete the battery. It is classified as a Rare REQ and can be summoned in Warzone at Level 4 energy. Can now be zoomed in with Smart scope to decrease reticle bloom. Overcharges now track targets better if the player is "scoped-in", similar to the Type-56 needler. Is once again able to EMP vehicles. Increased damage, killing a fully-shielded Spartan in 9 bolts. Overcharges drain 10% of the battery in the campaign and 15% in the multiplayer. John-117 overcharging a plasma pistol during the Raid on Argent Moon in Halo 5: Guardians. First-person view of the plasma pistol by Fred-104 in the Halo 5: Guardians campaign. First-person view of Spitfire by Edward Buck in the Halo 5: Guardians campaign. First-person view of the plasma pistol in Halo 5: Guardians. Smart scope with the plasma pistol in Halo 5: Guardians. Third-person view of the plasma pistol engaged in smart scope. The plasma pistol overheating in Fred-104's hands. A Seeker-clad Spartan-IV with an overheated plasma pistol on a Forge remake of Battle Creek. An Air Assault-clad Spartan-IV with Spitfire on Escape from ARC. First-person view of Void's Tear. A Spartan wielding Void's Tear. The effect created by Void's Tear.